If you do order the white fish it is very possible you’ll be doing so while white fish (other white fish, presumably not the one about to be your meal) swim a few meters from your head. You’ll also spot sharks, sting rays, grouper, turtles, cichlids (see comment #2, below) and a whole host of tropical fish. After some time here it is hard not to feel like a marine creature yourself, connected to that rich undersea world hidden from land dwellers. 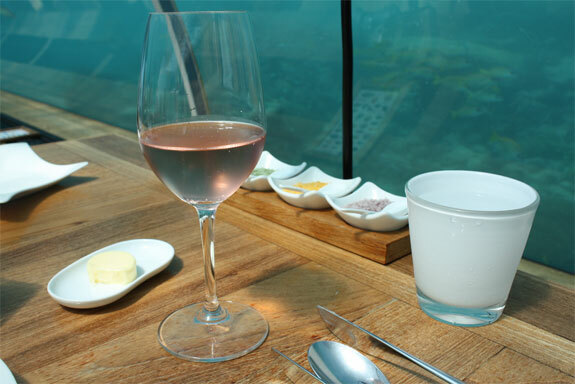 The experience will be especially profound for people who have never scuba dived, though even for longtime divers there’s something romantic about eating here. 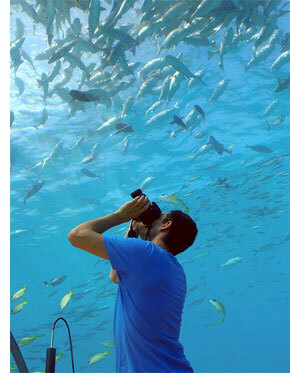 You needed not be a scuba diver, or swimmer of any sort, to get to the Ithaa Undersea. The way to the restaurant consists of a walk to the end of a pier and then a descent down a spiral staircase. After you eat you might feel soaked by the bill—a lunch for two will set you back around US$120. Even that those prices you’ll need reservation a place at this 14-seat restaurant in advance. The Ithaa Undersea is part of the Conrad Maldives Rangali Island, a gorgeous luxury resort spread out over two islands in the Maldives. We suggest having lunch, not dinner, at the Ithaa (it is closed for breakfast) because the prices are cheaper and the watery view is at its best when the sun is shining. Soneva Gili – No Shoes. No News. Pure, Private, Beach Relaxation. The food was great, the view is stunning. Really nice. 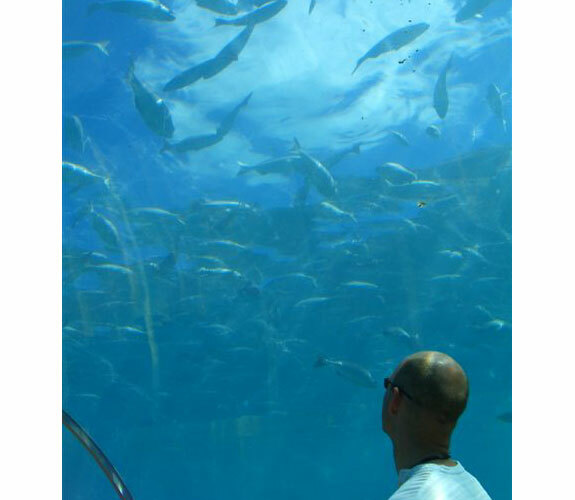 The view of fishes above is surreal. How much does food at Ithaa cost?? Thanks SCS. A scale of 6 1/2 largely satisfies me. 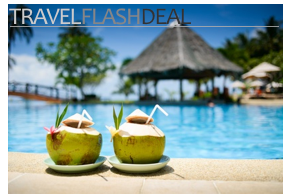 With my wife, we have Maldives in mind as one of our future romantic vacations. Just need to save money and we’ll be there. Thanks for this highly informative article and fun article. I enjoyed reading it. Tell me: should I expect some upscale fine dining level (in terms of cooking, refinement, presentation) of food in that restaurant? PS: I dream night and day about the Maldives Islands. It’s so far from where I am (Canada) but I know it’s paradise on earth. I’m willing to indulge in a 1 week visit of the Maldives. Hopefully, soon. 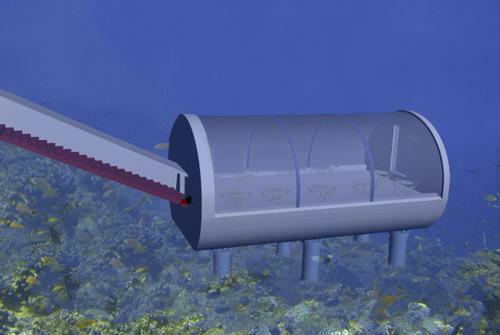 On a refinement and food quality scale of 0 to 10—0 being McDonald’s and 10 being, say, San Francisco’s French Laundry or Tokyo’s L’Osier—I’d give the Ithaa Undersea a 6 1/2. The food, service and presentation is good. 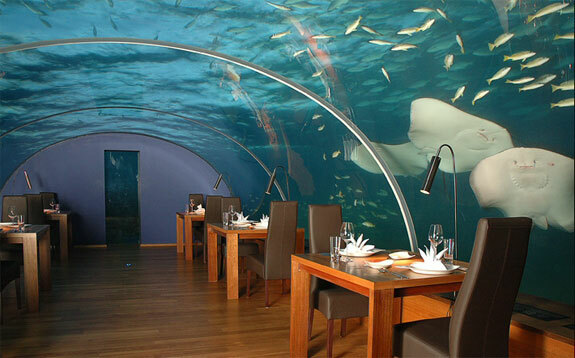 But the restaurant’s underwaterness is clearly the reason to come here. Can you see anything at night? 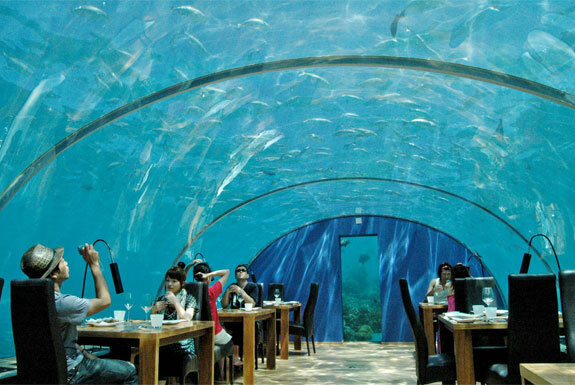 Also, will they let people swim/snorkel above and around the restaurant? They have some lights that allow you to see a little bit at night but, as mentioned in the review, the view (and atmosphere inside the restaurant in general) is more stunning during the day when the sun is out. As for swimming above the restaurant, that’s a good question. I don’t know. I don’t remember seeing any oneswimming by the restaurant. But I don’t remember anything stopping people from swimming there either. 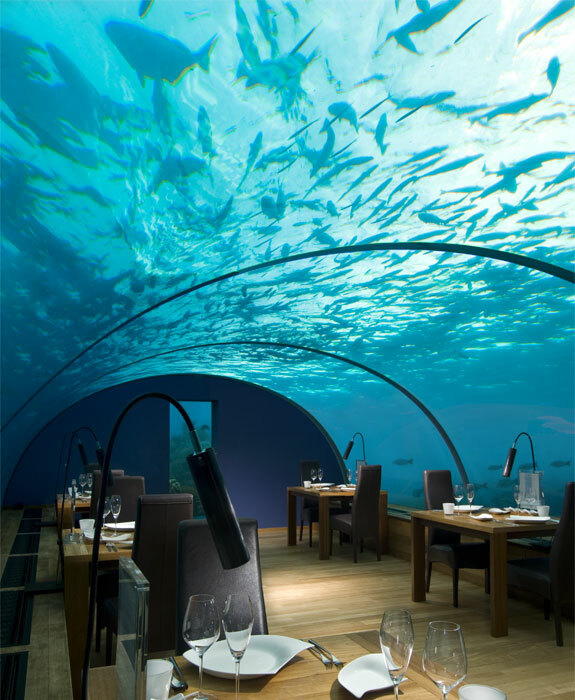 Aside from the great dive sites, underwater restaurant is also one of the tourist attraction in Maldives that you shouldn’t miss when you visit Maldives. Yes, you don’t need to stay at the hotel. However, the Conrad is on a small island. It takes quite a bit to get there. So, practically speaking, if you are going to make the journey from Male for the restaurant you may as well at least spend one night and enjoy what is a rather cool resort even without the Ithaa. Can I book a table here if i’m not staying at the hilton? how do you get freshwater? lalalala: I’m not sure I understand the question. The restaurant is connected to a dock by a staircase. Getting supplies (or yourself) to the restaurant is as easy as walking down the staircase. The person in the first comment got OWNED! So learn something and keep your mouth shut from now on about the information that you lack in that little brain of yours. We hesitated publishing the above comment, not because it questioned what we wrote (we welcome that) but because this is a fun site about spotting cool stuff — there’s no reason to be rude in the process. As for the Cichlids . . .
We included them in our post because when we went snorkeling in the Maldives with a local that’s how he identified some of the fish we saw. Still, this comment got us wondering: Were the fish our Maldivian (?) friend pointed out to us really cichlids? In searching for our answer consulted several sources, both online and in print. This site . . . So much for them only being in Africa and South America. According to that same site “Cichlids also exhibit a wide salinity tolerance, and some species are found in brackish and marine waters.” So much for them only being freshwater fish. We noted with interest the description of the Etroplus maculatus species of cichlid. The site does not say they live in the Maldives. But they are in Kerela, which is the part of India closest to the Maldives. Also, the picture of this fish matches with the one we remember seeing. Further still, this cichlid type inhabits “shallow areas of coastal, brackish rivers and lagoons.” When you keep this species in a tank you are, in fact, suppose to add salt to the water. (So, not to put too fine a point on it, but this commenter is wrong: you can see chilids swimming in the ocean in India). Now, as it happens, there’s a brackish/freshwater lagoon very close to the Ithaa Undersea Restaurant. So, were those fish our local snorkeling partner pointed out to us really cichlids? It is very possible they were, yes. 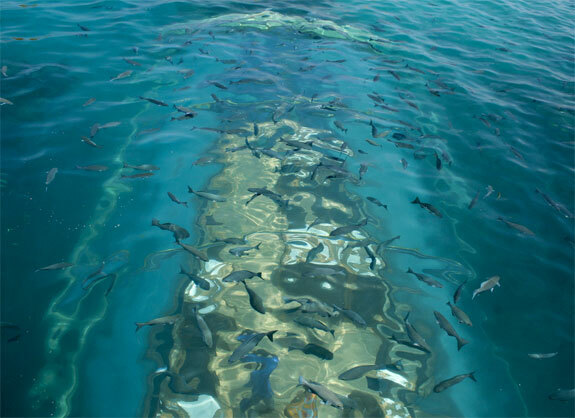 Perhaps some fish expert reading this post can go check it out for us. Regardless, the larger point remains: Eat at the Ithaa and you’ll see a huge variety of brightly colored fish in a variety of species that might—or might not—include cichlids. cichlids are freshwater fish from africa and south america, you idiots. you won’t see one swimming in the ocean in india.